The tree of the knowledge of good and evil (עֵץ הַדַּעַת טוֹב וָרָע; Hebrew pronunciation: [ʕesˤ hadaʕaθ tˤɔv waraʕ]) is one of two specific trees in the story of the Garden of Eden in Genesis 2–3, along with the tree of life. Genesis 2 narrates that God places the first man and woman in a garden with trees of whose fruits they may eat, but forbids them to eat from "the tree of the knowledge of good and evil." When, in Genesis 3, a serpent seduces the woman to eat from its forbidden fruit and she also lets the man taste it, God expels them from the garden and thereby from eternal life. The phrase in Hebrew: טוֹב וָרָע, tov wa-raʿ, literally translates as good and evil. This may be an example of the type of figure of speech known as merism, a literary device that pairs opposite terms together in order to create a general meaning, so that the phrase "good and evil" would simply imply "everything." This is seen in the Egyptian expression evil-good, which is normally employed to mean "everything." In Greek literature, Homer also uses the device when he lets Telemachus say, "I know all things, the good and the evil" (Od.20:309-10). However, given the context of disobedience to God, other interpretations of the implications of this phrase also demand consideration. Robert Alter emphasizes the point that when God forbids the man to eat from that particular tree, he says that if he does so, he is "doomed to die." The Hebrew behind this is in a form regularly used in the Hebrew Bible for issuing death sentences. In Jewish tradition, the Tree of Knowledge and the eating of its fruit represents the beginning of the mixture of good and evil together. Before that time, the two were separate, and evil had only a nebulous existence in potential. While free choice did exist before eating the fruit, evil existed as an entity separate from the human psyche, and it was not in human nature to desire it. Eating and internalizing the forbidden fruit changed this and thus was born the yeitzer hara, the Evil Inclination. In Rashi's notes on Genesis 3:3, the first sin came about because Eve added an additional clause to the Divine command: Neither shall you touch it. By saying this, Eve added to YHWH's command and thereby came to detract from it, as it is written: Do not add to His Words (Proverbs 30:6). However, In Legends of the Jews, it was Adam who had devoutly forbidden Eve to touch the tree even though God had only mentioned the eating of the fruit. In Christian theology, consuming the fruit of the tree of knowledge of good and evil was the sin committed by Adam and Eve that led to the fall of man in Genesis 2-3. In Catholicism, Augustine of Hippo taught that the tree should be understood both symbolically and as a real tree - similarly to Jerusalem being both a real city and a figure of Heavenly Jerusalem. Augustine underlined that the fruits of that tree were not evil by themselves, because everything that God created was good (Gen 1:12). It was disobedience of Adam and Eve, who had been told by God not to eat of the tree (Gen 2:17), that caused disorder in the creation, thus humanity inherited sin and guilt from Adam and Eve's sin. In Western Christian art, the fruit of the tree is commonly depicted as the apple, which originated in central Asia. 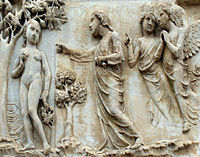 This depiction may have originated as a Latin pun: by eating the mālum (apple), Eve contracted malum (evil). It is also possible that this depiction originated simply because of the religious painters' artistic licence. The Quran never refers to the tree as the "Tree of the knowledge of good and evil" but rather typically refers to it as "the tree" or (in the words of Iblis) as the "tree of immortality." 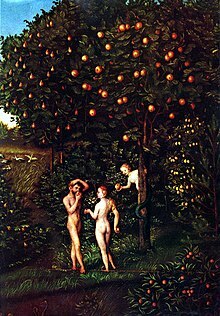 Muslims believe that when God created Adam and Eve, he told them that they could enjoy everything in the Garden except this tree, and so, Satan appeared to them and told them that the only reason God forbade them to eat from that tree is that they would become Angels or become immortals. When they ate from this tree their nakedness appeared to them and they began to sew together, for their covering, leaves from the Garden. The Quran mentions the sin as being a 'slip', and after this 'slip' they were sent to the destination they were intended to be on - Earth. Consequently, they repented to God and asked for his forgiveness and were forgiven. It was decided that those who obey God and follow his path shall be rewarded with everlasting life in Jannah, and those who disobey God and stray away from his path shall be punished in Jahannam. A cylinder seal, known as the Adam and Eve cylinder seal, from post-Akkadian periods in Mesopotamia (c. 23rd-22nd century BCE), has been linked to the Adam and Eve story. Assyriologist George Smith (1840-1876) describes the seal as having two facing figures (male and female) seated on each side of a tree, holding out their hands to the fruit, while between their backs is a serpent, giving evidence that the fall of man account was known in early times of Babylonia. The British Museum disputes this interpretation and holds that it is a common image from the period depicting a male deity being worshipped by a woman, with no reason to connect the scene with the Book of Genesis. ^ a b Gordon, Cyrus H.; Rendsburg, Gary A. (1997). The Bible and the ancient Near East (4th ed.). New York: W.W. Norton & Co. p. 36. ISBN 978-0-393-31689-6. ^ Harry Orlinsky's notes to the NJPS Torah. ^ Wyatt, Nicolas (2001). Space and Time in the Religious Life of the Near East. A&C Black. p. 244. ISBN 978-0-567-04942-1. ^ Alter 2004, p. 21. ^ "The City of God (Book XIII), Chapter 14". Newadvent.org. Retrieved 2014-02-07. ^ Adams, Cecil (2006-11-24). "The Straight Dope: Was the forbidden fruit in the Garden of Eden an apple?". The Straight Dope. Creative Loafing Media, Inc. Retrieved 2008-10-06. ^ Mitchell, T.C. (2004). The Bible in the British Museum : interpreting the evidence (New ed.). New York: Paulist Press. p. 24. ISBN 9780809142927. ^ The British Museum. "'Adam and Eve' cylinder seal". Google Cultural Institute. Retrieved 2017-04-06. ^ Ferguson, William (1850). The Palmyra Palm, Borassus Flabelliformis: A Popular Description of the Palm and Its Products, Having Special Reference to Ceylon : with a Valuable Appendix Embracing Extracts from Nearly Every Author that Has Noticed the Tree. Observer Press. p. 4. Retrieved 10 May 2015. ^ Food of the Gods: The Search for the Original Tree of Knowledge. McKenna, Terence. 1992. Knight, Douglas (1990). Watson E. Mills (ed.). Mercer dictionary of the Bible (2d corr. print. ed.). Macon, GA: Mercer University Press. ISBN 0-86554-402-6.